This year, our family was traveling on the Feast of the Holy Family (for Catholics, this occurs on the Sunday after Christmas), and for the first time in many years, I was not in church that day. I was sad to miss this special mass because it’s always one of my favorites. The timing is almost perfect, usually coming just a few days after Christmas, when the excitement is over, the house is a mess, and we’ve had LOTS of time with those we love. Time with all of our loved ones is precious, especially as parents get older, teenagers go off to college, and young adults move away for their first jobs. But sometimes, this time of year, it doesn’t feel that way – we’ve had all the family we can stand. Usually, we’ve had to spend time with at least one relative whose view of the world is dramatically opposed to our own, or whose habits drive us crazy. That’s why remembering the value of family now is more important than ever. As a parent, I have been surprised to learn that many of my children’s memories of their childhood are quite different from my own. Another mom recently told me how her own children remembered things she had said or done to hurt them that she doesn’t remember at all, or that she felt were taken out of context. We all hurt each other, and as we get older, we long for others to offer forgiveness and mercy for the times we have hurt them. With the New Year approaching, let’s offer mercy and forgiveness to one another. Of course, I know there are families where abuse is occurring, and no one should condemn those who have had to separate or divorce for that reason. In many cases, though, whether it is between a husband and wife, parents and children, siblings, in-laws or other relatives, mercy and forgiveness is possible, even though it might be hard. To quote the great St. John Paul II, “The family is placed at the center of the great struggle between good and evil, between life and death, between love and all that is opposed to love. To the family is entrusted the task of striving, first and foremost, to unleash the forces of good.” As the year ends and a new one begins, let us stay of the side of love. Just the other day I was reminded of these words from the bestselling book, Same Kind of Different as Me, by Denver Moore and Ron Hall. Denver was a homeless man living in Fort Worth who developed an unlikely friendship with a Ron, a millionaire art dealer. The two men became friends as a result of Ron’s wife, Debbie, who devoted her life to ministering to the homeless. As Debbie was dying a painful, lingering death from cancer, Denver spoke those prophetic words to his friend, Ron. He was right – she lingered on almost a full month after doctors told them she wouldn’t live more than a few days. But even in her last week, unable to speak, Debbie had an impact. It was during that time that Denver came to her and told her that she didn’t need to be afraid to die, he would “pick up her torch” to continue her work with the homeless. Yet another family friend, visiting her on her deathbed, had a profound spiritual experience that changed his life. As a healthy person who has known little physical suffering in my life, I don’t dare to judge this young woman. Yet I feel saddened that she has decided to cut short the days that have been given to her in this life. Because she is choosing the date of her own death, she and those around her may miss opportunities to impact others in ways we will never know about. In her last days in the hospital, Ellen was still joking, encouraging and cajoling her children and grandchildren as they all said goodbye. At her funeral, the church was filled with people who got to hear stories of her life of service, love, faith and joy. Ellen was an example of someone who got the most out of every one of her days on earth. I speak from personal experience when I say that watching your loved one suffer can be nearly unbearable. I have had many agonizing conversations with friends whose parents are suffering from illness, dementia or just old age. When a loved one’s pain is great, you sometimes wish for a quick end, and choices like Brittany’s are tempting. But over and over again, I have seen good come out of suffering. When we respond with love and tenderness to someone who is hurting, it can impact those around us. When we ourselves suffer, it can prick a long-dead conscience and cause us to long to make peace with those we have hurt. Of course, I would never argue that we should simply allow people to suffer for their own good, or for the good of others. I believe we should use modern medicine to relieve pain and suffering so that those who are dying can do so as gently and peacefully as possible. I do believe it is wrong, however, to try to choose or control the date of our death. My belief stems from a fundamental conviction our lives are not our own, and that God has his own purposes for each person’s life. Courage, love and faith in the face of suffering and death can change the world. As my own mother used to say, be careful how you live – and how you die. You never know who’s watching. Next Wednesday, March 5, will be Ash Wednesday, the beginning of Lent. For Catholics and many other Christians, Lent is a season of self-reflection and repentance, where we examine our lives and seek to draw closer to God as Easter approaches. Friends from church are the ones who supported me when I was struggling and comforted me when my mother passed away. Almost every week, as I listen to the readings and sing the hymns and responses, I feel peace, comfort and encouragement. Many other times I have felt the sharp sting of correction when I realized how I needed to work on my own temper, harsh words or judgmental attitudes, and I would leave resolved to do better as a wife, a parent and a friend. I have happy memories of leading bouncing children in singing during Vacation Bible School, and letting my own children drop leaves over the bridge of the creek next to church for “leaf races”. Because they also went to the school associated with our church, almost every aspect of our lives – sports and scouting and music lessons – centered around our faith community. Of course, neither the school nor the church was perfect, but it was, for the most part, a safe and warm place to grow up. For all these reasons, I have been saddened by news reports in recent years that the younger generation – one third of adults under 30 – have no religious affiliation at all. Although a majority of them still believe in God, they are not seeking to belong to any particular faith. To me, this is a great loss – both for our faith communities and for these young people. Ironically, this change in attitudes comes at the same time as new research indicating that regular attendance at worship services (not just Christian, but also those of Jewish and other faiths) is associated with better health, longer life, and less depression. Children who attend church regularly also perform better academically, and are less likely to get divorced or live in poverty as adults. This positive effect for children is even more pronounced among those who grow up in impoverished neighborhoods. Of course, not all churches and faith communities are healthy. One study showed that when a person experiences God as distant or unloving, prayer increases emotional distress, rather than bringing peace or comfort. It is important to seek out a faith community that consistently exhibits love as its primary focus. But when you find that special place, it can change your life. These days, you don’t even have to get up early to attend church. Many churches have evening services, so you can get the extra rest you need on Sunday morning. And as long as you’ve dressed up a little, why not go out to dinner afterward? It makes a great way to start the week. I’ll admit, it isn’t always easy to get to church, especially with children. I can’t begin to count the hours I sat in church with a crying baby or squirmy, bored children. Many times we were late, and at least one of us had something wrong with our hair or our clothes. But I also have wonderful memories of the sunlight streaming through the stained glass windows, all three of my kids forming a group hug with me during the sign of peace, and singing the hymns loud and clear. It’s a place of peace and joy – why not come in and stay awhile? Around this time last year, I was spending every day at the hospital with my mother, who was slowly losing her battle to live. I have written elsewhere about the unexpected gifts that came with her passing – all of my children safely home from college, the chance to say goodbye to her as a family, with prayers and a blessing from a dear priest who knew us well, and holding her memorial service in a long-closed, beloved country church. But even with these blessings, I knew the day she died that Christmas would always be different for me. You see, my mother passed away on Christmas Eve, Dec. 24, 2012. Instead of our family tradition of Christmas Eve mass followed by a quiet dinner at home, I spent the evening in a lonely hospital room with my exhausted and bereft father until she finally left us late that night. Yet in spite of the terrible sadness, I made a promise to myself that day that I would not forever after hate Christmas. It just seemed wrong to me, and I knew my mother most of all would not want me to lose the joy of Christmas because of her. As the holidays approached this year, I began to think about how to deal with sadness in a time of joy. I do have days when I am filled with sadness, and just getting anything done becomes a huge struggle. At the same time, I don’t want to let myself be paralyzed by grief, and I don’t want to dampen the joys of others. Obviously, I am still “in process” and I don’t have everything figured out, but there are a few things that have helped me that I would like to share. First, remember that you are not alone. As I thought about my own difficulties, I quickly realized how many other people are hurting. We all know people who are fighting cancer, who have lost a child, or who are going through a divorce or a loss of employment. Even if your pain is the result of your own mistakes, you are not alone. Billy Graham’s middle daughter, Ruth Graham, wrote a book entitled, “In Every Pew Sits a Broken Heart” after she went through a second painful divorce. Suffering knows no boundaries, even among “the best people.” Reaching out to others who are also hurting can help to ease your pain. Second, be merciful to yourself. Every grief and loss can bring recrimination – “if only I had called her more often, if only I had insisted that he go to the doctor, if only I hadn’t given up on my marriage.” If you are human, by the time you are even 25 years old, you will probably have done something that you regret deeply. If you can find a way to forgive others who have hurt you, try to find a way to forgive yourself. Also, try to be realistic about the demands you place upon yourself. If your time and your energy or your finances are limited, allow yourself to set limits on what you do for Christmas. Many people would rather get a phone call or a card than another gift that they won’t know what to do with. And if your efforts to make “the perfect Christmas” leave you exhausted and cranky, what will your family remember? My best memories are of fun times spent with family and friends, rather than any “perfect meal” or “perfect gift.” Talk about your plans ahead of time and decide which things are most important, rather than try to live up to everyone’s unstated expectations. Finally, remember the real message of Christmas. People tend to think of Christmas as a time when everyone rejoices with their perfect families, and everyone gets along, has wonderful food and gets everything they want under the tree. But that’s not the message of Christmas. The message of Christmas is that God saw a world full of sin and pain, and had compassion on His people. He sent us a Savior, born in a manger, to enter into our weakness and sorrow, and bring us hope. After I lost my mother last year, I was strangely surprised by the ongoing grief that I felt. I suppose I thought that, because I was “prepared” for her death, and we had a good relationship, that I would quickly be at peace. I knew she was with God. However, her death was quickly followed by that of two other close family members: her oldest brother and my dad’s oldest sister. Still other friends and family were sick or going through difficult times. All of these things happening together made me feel as though my own world had shifted on its axis – just too many changes at once. I had known God’s presence during my mother’s death, but where was He now? Now some teachers of the law were sitting there, thinking to themselves, “Why does this fellow talk like that? He’s blaspheming! Who can forgive sins but God alone? I love this story because the friends of the paralyzed man would not give up – no matter what, they were going to get him to Jesus! When I am praying, I place the object of my prayer on the mat and I am dragging them to Jesus (even if they don’t want to go!) I struggle to lift them onto the roof and lower them down to Jesus. I know that if I can just bring them to Him, He can and will take care of them. Notice that the scripture says, “when Jesus saw their faith” (the faith of his friends) He said, “Son, your sins are forgiven.” However sick, weak in faith or reluctant people may be, we can always bring them to Jesus in prayer. Like the friends of the paralytic, we must not let any obstacles keep us from bringing those we love to Him. When Jesus had finished saying all this in the hearing of the people, he entered Capernaum. There a centurion’s servant, whom his master valued highly, was sick and about to die. The centurion heard of Jesus and sent some elders of the Jews to him, asking him to come and heal his servant. When they came to Jesus, they pleaded earnestly with him. “This man deserves to have you do this, because he loves our nation and has built our synagogue.” So Jesus went with them. Meditating on this scripture reminds me that God has the authority to heal and to deliver. In submitting to God and lifting up those I love in prayer, I recognize Jesus’ authority, just as the centurion did. The centurion was also humble, acknowledging his unworthiness for Jesus to come to him, yet asking for help at the same time. This story shows the power of faith on behalf of another, even when they are far away from us. Years ago, when I first read this story, I was offended. Why would Jesus ignore this woman and talk to her that way? My study Bible later revealed that the Greek word used here means something more like “puppies” or “pets” – not an ugly word, but perhaps a way Jesus was using to explain his priority – the lost sheep of Israel. Later, as a mother, I recognized this woman’s attitude – she would gladly bear any rebuff or insult if she could only get help for her child. Meditating on this scripture is easy for me – I know the humility and desperation of a mother with a sick child. The Canaanite woman knows that Jesus is her only hope and she is willing to humble herself before him. To me, this story also means that even when we come to Jesus with our flaws and weaknesses, He is willing to hear us if we humble ourselves for the sake of those we love. Bring your children – and your nieces and nephews, and your friends’ children – to Jesus. He is our only hope. When Jesus had again crossed over by boat to the other side of the lake, a large crowd gathered around him while he was by the lake. Then one of the synagogue rulers, named Jairus, came there. Seeing Jesus, he fell at his feet and pleaded earnestly with him. “My little daughter is dying. Please come and put your hands on her so that she will be healed and live.” So Jesus went with him. A large crowd followed and pressed around him. And a woman was there who had been subject to bleeding for twelve years. She had suffered a great deal under the care of many doctors and had spent all she had; yet instead of getting better she grew worse. When she heard about Jesus, she came up behind him in the crowd and touched his cloak, because she thought, “If I can just touch his clothes, I will be healed.” Immediately her bleeding stopped and she felt in her body that she was freed from her suffering. Given Jewish law about women and menstrual bleeding, Jesus’ response to this woman was remarkable for its compassion. Under Leviticus 15:19-30, this woman had been “unclean” for as many years as she had been bleeding, and therefore everyone and everything she touched was also made unclean. Not only was she unclean, she was also financially ruined with medical bills. We can only imagine her shame and pain and isolation! When the woman told Jesus what she had done, kneeling before him in the midst of a Jewish crowd, no wonder she trembled in fear! But Jesus’ response was filled with gentle kindness: “Daughter, your faith has healed you. Go in peace and be freed from your suffering.” I love this meditation for what it tells us about Jesus and women. How many of women’s medical ailments, from breast cancer to bladder infections, are “taboo” topics? Jesus reached out to this woman in her embarrassment and shame and healed her, praising her for her faith and speaking words of encouragement. For all who suffer with embarrassing or painful problems, medical or otherwise, Jesus stands ready to comfort, heal and encourage. This scripture spoke to me about the times when we are in great need of God’s healing, but feel paralyzed, unable to reach him. This man must have felt so alone, even in the crowd, hoping for healing and relief, but finding it always just out of reach. Jesus comes to him and heals him, even when he cannot get to Jesus. There are many kinds of wounds and diseases in our world – physical, mental, emotional and spiritual. I do not wish to imply that this way of praying is any “magic formula” for healing, but it has been a great comfort to me. In my prayers, by putting myself into the Gospel story – I become the man carrying my friend to see Jesus, or the woman pleading for her child — I draw closer and closer to Jesus, who is the same yesterday, today and forever. (Hebrews 13:8) We know He stands ready to hear us with the same heart of compassion He showed to the people in the Gospels. When I was a little girl, my favorite place in the world was my grandmother’s house in Savoy, Texas. My dad was in the Air Force, so we lived all over the country and even the world, but I always looked forward to going back to Savoy for summer vacation and Christmas. Savoy was home for my mother, and so it was home for me too. Sometimes, if I was really lucky, we would go back for Easter or a longer visit. All of my Blakey cousins would come too, a special treat for me since I was an only child. We spent our days in the summer fishing for crawdads (never caught one), playing in my grandfather’s garden and on top of the neighbor’s tornado shelter, soaking in a giant kiddie pool, and playing “Annie Over” with my aunts and uncles. We would sit on the ice cream maker as my dad and the uncles churned, waiting for delicious homemade ice cream. In the winter, we played in the house, hiding behind my grandmother’s giant overstuffed couch, and waiting for Santa Claus to come. Christmas morning, we all played together with our toys. I didn’t think much of it as a child, but my grandparents were a little different than most children’s. Edith Ferry – “Grandmother” – was actually my mother’s grandmother. Grandmother raised my mother and her brothers and sister after their mother, Grandmother’s daughter, died. When I was growing up, she lived in a small white clapboard house that shook when we kids ran through it, playing. Next door lived Earl Blakey – “Granddaddy”, my mother’s father, who, eighteen years after his wife’s death, remarried, but still lived next door to his former mother-in-law and took care of her. Granddaddy’s wife, Mary, completed the picture. So we had two houses to run between, Grandmother’s older house and my grandfather’s newer one with the large, neat garden out back with brick paths between the rows of corn. Across the street was kindly Mrs. Withrow, who had an excellent porch swing and always had candy or tiny toys, such as water pistols, just in case any children might come to visit. On Sundays, we went to the Savoy Methodist Church for church and Sunday School. My most vivid memory of going to church was seeing my grandmother struggle to climb those steep concrete steps. I remember thinking how hard it was for her to go to church – but she kept going anyway. Inside, I loved the tiny sanctuary with its sloped floor and old wooden pews. Behind the altar was a painting of Jesus in the Garden of Gethsemane. The last Easter I spent in Savoy was around 1970 or 1971. I had beautiful lavender and white paisley Easter dress with long sleeves, a ruffled skirt and a big lavender sash. I even had a lavender dog brooch to match. I remember proudly standing in the pew next to my grandfather and singing “God of Grace and God of Glory” – then looking up at him to realize he was completely off key! Somehow, even at that young age I understood how special the church was. I had no idea, though, that it was almost 100 years old, or that we would hold my grandmother’s funeral there in a few years. Time passed, and in January of 1972, my grandfather died. Two years later, my grandmother also passed away in January of 1974. The last service I attended at this church as a child was her funeral. With both grandparents gone, and Mary in a nursing home, family get-togethers moved to a lake house near Waco and we stopped coming to Savoy. My parents, cousins, aunts and uncles and I still saw each other three or four times a year, enjoying summer and Christmas together. Our family grew closer than ever. Eventually, all of us cousins grew up and got married and had children. I became a Catholic (that’s another story), but never forgot my family’s legacy of faith at the Savoy Methodist Church. On my 30th birthday, April 14, 1991, I was at the church for the special service when it received a historical marker. If that wasn’t enough of a blessing, I also had just found out that I was pregnant with our oldest child, Nicole. Over the years, as I grew older, I began to listen more closely to my mother’s stories about her family and Savoy. I learned how Earl Blakey had worked three jobs during the depression to support four children and his sickly father-in-law after losing his wife at the age of 34. My mom’s brother, O.J., remembered when his mother died – how Earl went outside and cried out to the heavens, “God, why did you take her?” Less than 10 years later, Earl’s oldest daughter, Billie, would die from diphtheria. Yet somehow through all these tragedies, Earl Blakey kept his faith, and found the strength to take care of his family and just about anyone else who crossed his path. My mother told me how he would come in late at night from his job at the filling station and toss her in the air, singing, “When the Roll is Called Up Yonder,” and how he would stay home on Saturday nights with her as a little girl, letting her put rollers in his hair and paint his nails with fingernail polish. He took groceries to the hungry and helped people find work. He helped nephews go to college and bought one young couple’s marriage license. My father says he was the best man he ever knew. My grandmother, Edith Ferry, kept her faith as well, even though she outlived all three of her children and took on four grandchildren to raise at the age of 50. The last few years of my mother’s life were sad and difficult. She was in terrible chronic pain and grew weaker and thinner before my eyes. She had been unable to attend church regularly for several years, but sometimes came to mass with our family. Around Thanksgiving, I knew the end was coming. My two greatest fears were that she would die in the middle of my two daughter’s college finals – so that they would be unable to say goodbye – and that we would have no one she knew to minister to her. I talked to our priest, Fr. Jonathan, about what we would do, and he assured me that he would come at any time we needed him. I said to him, “They’re Methodist, you know” and he said, “I don’t care, she’s MOM. I’ll be there, you just call me.” It so happened that he was my mother’s favorite priest – once she said, “I could almost be Catholic if they were all like Fr. Jonathan.” I was also afraid that we would be left with no place to have her memorial service with any connection to her faith or her home. I prayed fervently that God would help us through these difficult days and watch over her leaving us. I had no idea, however, how graciously he would answer my prayers. Shortly after Thanksgiving, my mom went back in the hospital and her condition continued to deteriorate. I kept praying. My daughters made it through their finals and the last one got home on Dec. 21. Just two days later, on Sunday, Dec. 23, around 4:00 p.m., the doctor told us that she wasn’t going to make it. I called my husband and he brought our kids to the hospital, and with my dad’s agreement, we called Fr. Jonathan. Fr. Jonathan had just gotten back to the rectory after a long Sunday. Even though he had 7 Christmas masses to say the next two days, he drove from Farmer’s Branch to Allen to pray with us. Fr. Jonathan (whose own father had been Methodist) “tuned his prayer to the Methodist dial” and prayed with our family, even letting my mom hold a rock from the Sea of Galilee, where he had just returned from a pilgrimage. My mom was radiant and she smiled at each of my children as they said goodbye to her. She even laughed at my son Jack’s bald head – he had gotten her permission to shave his head after finals. The next day, she went home. 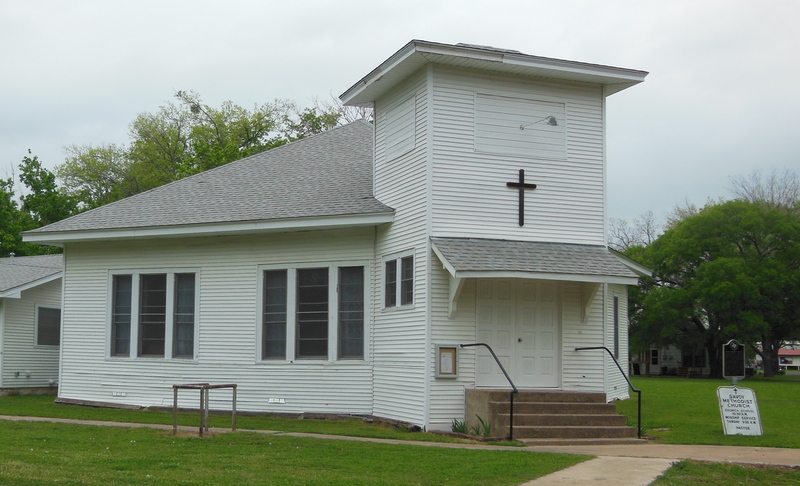 As we worked on planning my mom’s memorial service, my dad and I were surprised and thrilled to find out that Nancy Savoy, the widow of a descendant of the town’s founder, had bought the old church property and that it was being restored. How much it meant to our family when we got permission to have her “going home” service in her first spiritual home. One of my cousins commented after her service how much of our family’s life of faith had taken place in this church. As friends and family huddled in the old church on January 2nd (bundled up in our winter coats, it was freezing!) we rejoiced in my mother’s life and legacy of faith and family. With her cousin, Don Blakey’s, pastor and my own family’s Fr. Jonathan, we said goodbye to her in the place she loved the most – the Savoy Methodist Church. Now, months later, we are looking forward to May 27 2013, Memorial Day – when the Savoy Church will be rededicated in a special nondenominational service. Working on its restoration and rededication has been a tremendous blessing for my dad and me, and a special way to honor my mother. My prayer is that this little church will thrive once again as a spiritual home for others, just as it did for our family.